I just finished reading Roger Scruton's latest book, Conservatism: An Invitation to the Great Tradition (New York: All Points Books 2017). It is, ostensibly, written as an invitation to liberals (like me) to become conservatives. Unfortunately, I am unable to accept the invitation. When Scruton writes about conservatism, all of the attractions for me are in the principles that conservatives share (or adopt from) liberals, such as respect for the individual and principles of free trade. The more truly conservative aspects, including localism, tribalism, religious dogma, custom, and tradition I find less attractive. I do recognize that custom and tradition carry valuable information that never should be casually disregarded. But conservatives often over-value them, treating custom and tradition as if they have created the best achievable equilibrium conditions from which society dare not deviate. Unlike reactionaries, who want to return to a mythical better time (e.g., "Merry England"), conservatives believe that modern institutions would be just fine if only we stopped tinkering with them. As an indication of the extent to which custom and tradition remain at the heart of modern conservatism, I counted the number of times Scruton used those two terms (or variations on them) in his book. The combined total is 57 uses in a book of 155 pages. I learned some surprising things from reading Conservatism. Did you know that Thomas Jefferson, Jeremy Bentham, and Jose Ortega y Gasset were all "conservatives"? No? Neither did I. 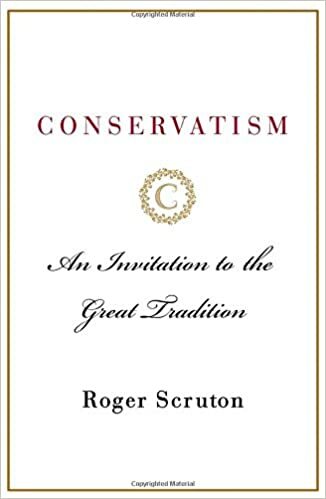 Indeed, among the problems with Scruton's invitation to liberals to join the conservative movement is his inability to specify just what is they'd be signing up to. In the present context, what is it about Jefferson and Bentham that made them, all things considered, "conservatives"? Well, Jefferson was a states-rights advocate who wanted a weak national government. Those are "conservative" (at least, anti-federalist) positions. Likewise, the fact that he was an unrepentant slave-owner, who opposed abolition more staunchly the longer he lived. On the other hand, he was among the leaders of a radical revolution against Mother England, which was opposed by American Tories (conservatives); he was a theist who believed in religious freedom at a time when that was not at all a conservative position; and he believed in individual rights against the state (a liberal position if ever there was one). And don't even get me started on Bentham, who wanted to rid the world of the common law, which is among the dearest of institutions to modern conservatives (as Scruton reminds us). Although I haven't cracked it yet, at first glance it appears that Scruton's 1980 book, The Meaning of Conservatism (South Bend: St. Augustine's Press 3d Ed. 2002) might provide a more useful introduction to and exposition of Scruton's conceptions of conservatism (v. liberalism). I'll let you know.